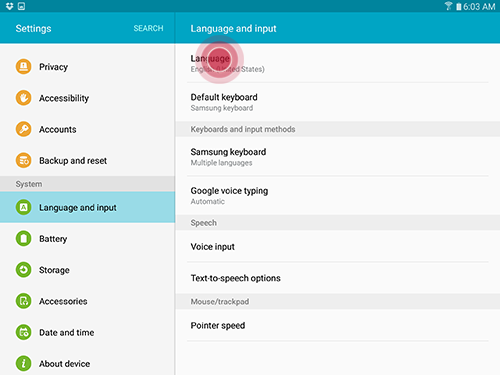 How do I change the Default System Language and Input Settings on my Galaxy Tab S2? 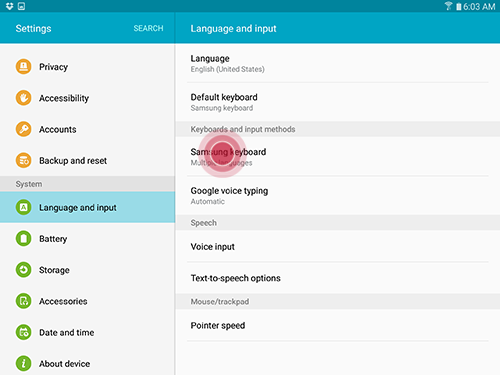 Configure your device's language and input settings. 1 From the Home screen, touch Apps > Settings. 2 Scroll to and touch Language and input > Language. 3 Select your preferred system display language. 2 Scroll to and touch Language and input > Samsung keyboard. 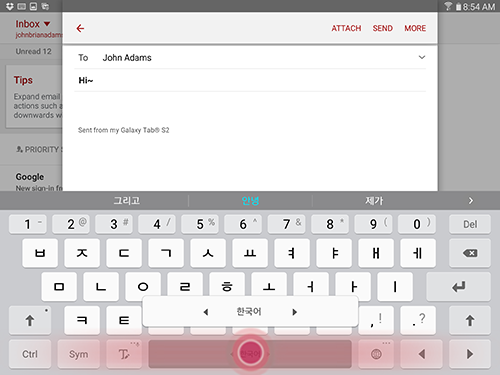 3 Touch Add input languages. 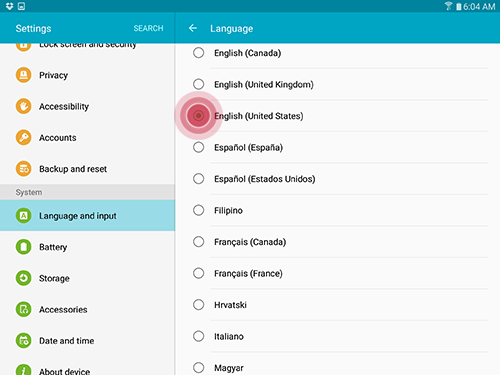 4 Device automatically checks for new language list, or you can touch MORE > Check for update to manually check for new language list updates. 5 Touch the next to the language(s) to turn. You can add multiple language(s). Note: When update is available for the downloaded language(s), UPDATE button will be displayed next to the language. 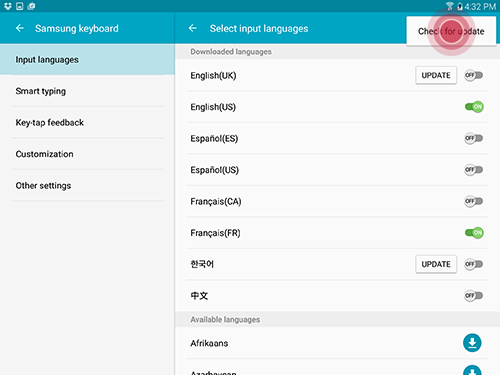 6 Scroll down to view more available languages and touch next to the language to download keyboard for that language. 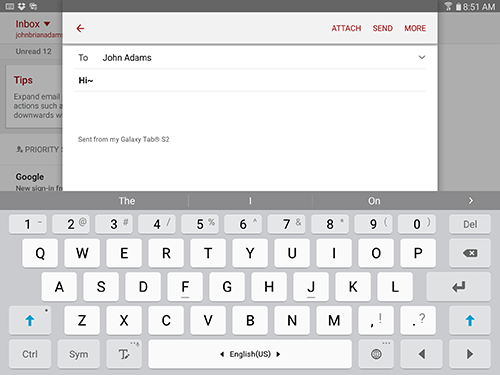 1 Launch Samsung keyboard by tapping in any available text field. 2 Touch and slide the SPACE bar side to side to select your preferred keyboard input language. 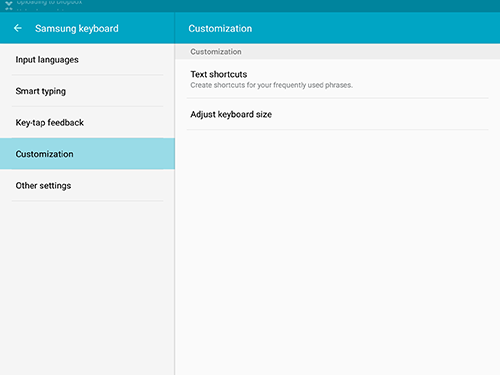 Configure options for using the Samsung keyboard. 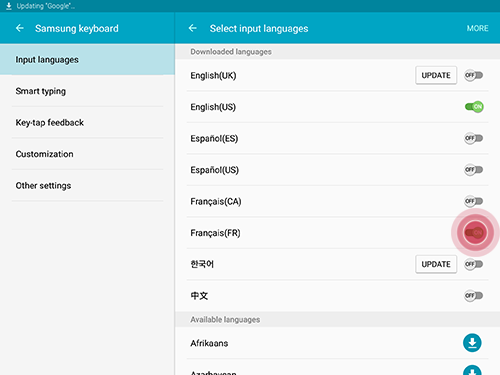 •Input languages: Choose which languages are available on the keyboard. 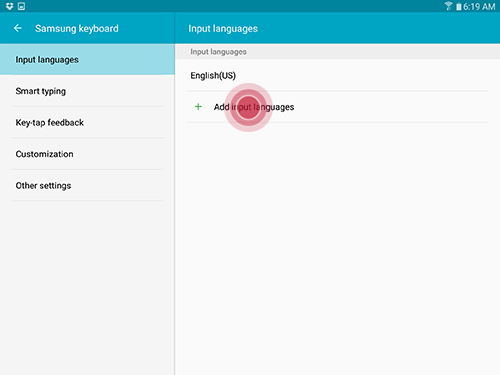 Tap Select input languages to add languages to the keyboard. To switch between languages, slide the space bar sideways. •Smart typing: Select smart features to assist your typing. ◦Predictive text: Allow Predictive text to suggest words matching your text entries, and, optionally, complete common words automatically. Predictive text can learn your personal writing style from your contacts, messages, Gmail, and social networking sites — improving its accuracy of predicting your text entries. ◦Auto replace: Automatically replace misspelled words. ◦Auto check spelling: Check spelling as you type. ◦Auto capitalize: Automatically capitalize the first letter of each sentence. ◦Auto spacing: Automatically insert spaces between words. ◦Auto punctuate: Automatically insert a full stop by tapping the space bar twice. ◦Keyboard swipe: Configure keyboard swipe to type by sliding your finger across the keyboard. 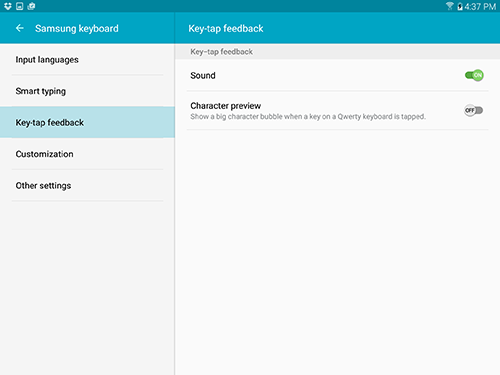 •Key-tap feedback: Configure feedback features for typing. ◦Sound: Play a sound when you tap a key. ◦Character preview: Show a big character bubble when a key is tapped. •Customization: Customize text shortcuts and keyboard size. ◦Text shortcuts: Create shortcuts for your frequently used phrases. ◦Adjust keyboard size: Adjust the size of the keyboard on the screen. Tap RESET to return to the default size. •Other settings: Configure other keyboard settings. 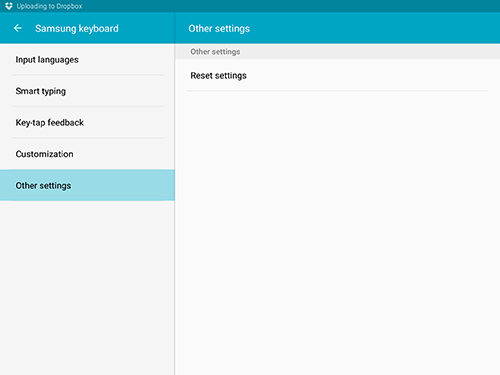 ◦Reset settings: Reset all settings for the Samsung keyboard. What is Smart Stay feature, and how do I use it on my Galaxy Tab S2? How do I change or hide notifications on my Galaxy Tab S2 lock screen?